Christmas Day is a special time of year at Jacksons Lane. For over 40 years we have thrown open our doors on Christmas Day to provide a full day of entertainment alongside Christmas lunch with all the trimmings, Christmas presents and transportation for older and disabled people in our community who otherwise would be spending Christmas alone. This year we would like to ask you to help make this gift to our community possible, by supporting our Christmas Day Appeal. We work with a fantastic team of volunteers who act as drivers, cooks, entertainers, carers and waiters to make Christmas as special as possible for those who do not have family or support structures that can be with them during the holiday. 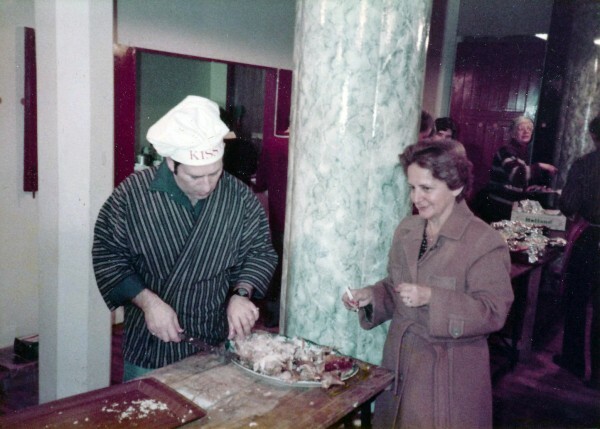 World renowned playwright, Arnold Wesker, carves a turkey at one of the early Christmas Day events at Jacksons Lane. For 40 years this has been led by Paul and Jan Brooker - their dedication and generosity has meant this annual event has taken place at Jacksons Lane since 1975. This event is one of our absolute favourite things that Jacksons Lane does each year. It is a real celebration of community, activism and performance, and it shows the power we have as people to create positive social change for those around us. Every year we talk with hundreds of people who share our feelings about the importance of this day and give their time and energy to making it a day to remember. We work with people who may be able to help out as a driver for guests with mobility issues; people who may be able to donate some money to support the day; people who may work at companies who can provide some of the food; and people who want to hear our experiences so they can launch similar initiatives in their own communities. To make Christmas Day at Jacksons Lane possible, we fundraise thousands of pounds. It is only through the generosity of our volunteers and donors that we are able to do this, and we really can not say loudly enough what a hero every volunteer and every donor is to us. This year we are running a special Christmas Day appeal, as there is added incentive to donate! A matched-funding scheme means that every £ we receive in donations is doubled. With Gift Aid, this means that a £100 donation is worth £225 to us. This could help us purchase turkeys and mince pies for our Christmas feast, help us decorate Jacksons Lane to make it sparkle on Christmas Day, or make sure that every guest has a Christmas gift from Santa. 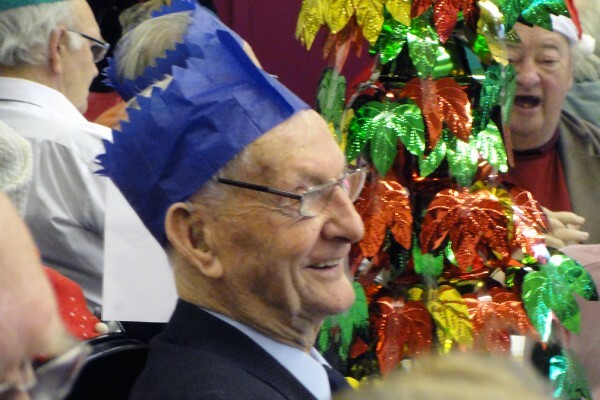 Every donation really counts to make sure Christmas Day is wonderful for older and disabled people in our community. If you are interested in volunteering, you can download a FAQ and Volunteer Info Sheet here. If you would like to donate to this project, you can do so online here, or by phone on 020 8340 5226. If you would prefer to support via a bank transfer, please use the reference ‘Christmas Day’ and the details below. Account No: 00016751, Sort Code: 40 52 40. If you have any questions about supporting Jacksons Lane, please contact Katy Donnelly, Development Manager, on [email protected]. Thank you to everyone who has made Christmas Day at Jacksons Lane possible since 1975. The impact you make for the people who rely on this service is the best Christmas present we could ask for.